It’s easy to mix up those two coconut songs. I wanted this strip to look looser than usual so I drew it all freehand straight into Photoshop, no sketches or penciling first. Wouldn’t her food allergies also include coconuts? 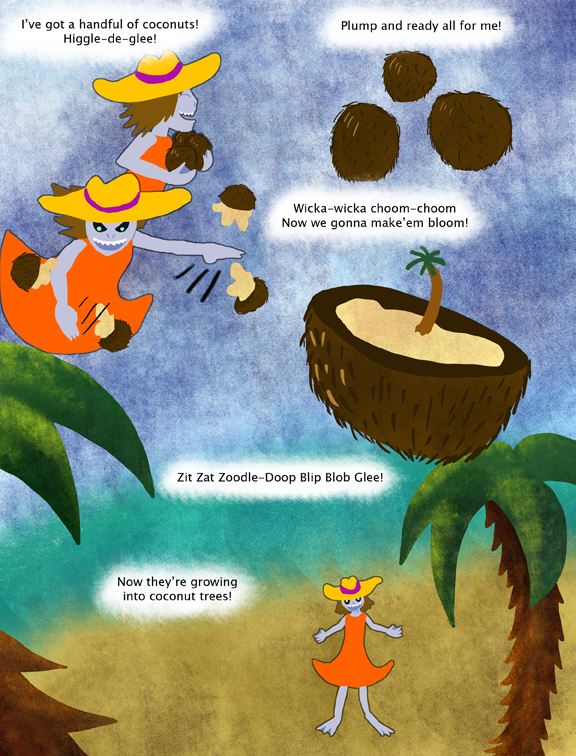 This page is a jaunty, lighthearted change from the more serious hospital storyline – except for the bit where it looks like glaring, fang-baring Selkie is throwing coconuts at the reader. That’s the trouble with having fangs, I suppose; a gleeful grin can look quite threatening. And that’s why you should never smile at a chimp, orangutan, or really any mammal besides a human or friendly dog, but especially not an ape – since humans are one of the only species on our planet/in our dimension that bare their teeth to indicate pleasure as well as aggressive intentions. I am curious to know if sarnothi also smile to indicate happiness, or if this is a trait that the sarnothi we’ve seen have picked up from interacting with humans. G-d, I love that story. I’ve learned (from the book ‘Briefe in die chinesische Vergangenheit’ – ‘Letters to the Chinese Past’) that Chinese seem to see the happy smiles in our advertisings as menacing growl. So this is not only species-specific but culture-specific as well. Btw, as I’ve learned the word, a smile can be as well with closed as with opened lips. Quick trip to the sunny tropics to get her warm and well, or fever-induced hallucinations? Only coconut song I was aware of is “I’ve got a lovely bunch of coconuts”. The “wicka-wicka-choom-choom” makes me think of “Chicka-chicka-boom-boom, will there be enough room?” which is about numbers climbing a tree (I don’t remember whether it was a coconut). Letters, not numbers, but yes, it was a coconut tree. Yep, it’s a coconut tree. I think that is what is being mashed up with ‘I’ve got a Lovely Bunch of Coconuts’, though our intrepid heroine seems to be making her own words. I’m lost…..where are going to/coming from w/this comic? I think this may be a dream. Yeah, that’s what I’m assuming also. If so it means Selkie is getting some much needed sleep – best thing for you if you’ve got a cold. Heh people don’t realize that this is a filler comic strip. As evidenced by… what? Dave usually says if he’s doing fillers. I don’t see any indication of that anywhere. Do you? This is the part where we play the game “Find how this comic strip fits with the overall plot of the comic”. “It’s a dream” – based on Dave having used a dream sequence with fantastical setting before, without having separately announced it being a dream. Or SELKIE hit the funny juice. Or some seemingly inoffensive substance that causes hallucinations in sarnothi and its pernicious influence was never discovered as of yet. 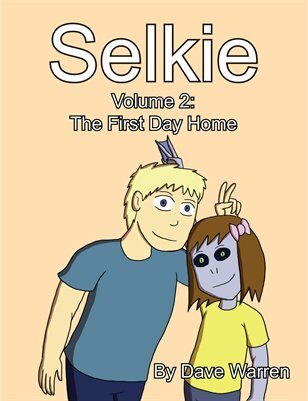 I just realized that Todd won’t have to worry about Selkie and booze, during the crazy teen years, since all alcohol is vegetable based. Most probably won’t have to worry about cigarettes or drugs, either. And unless there’s some periwinkle boys around, he ain’t got to worry about pregnancy. As a father that lived through THREE daughters in the crazy-teen years, I know. He’s LUCKY. The art on this page looks lovely. Why did I have Mr. Weebl’s crab song in my head while reading this?? ?